I am linking up with Gussy Sews Inspiration Workshop and the prompt this week is DIY. It's time to share my latest decorating project! It's not much of a secret that I enjoy coffee. The enjoyment of coffee runs deep in my family; it's a part of life. You wake up, you have coffee. Then mid-morning, you have more. Lunchtime, afternoon-time, really anytime is time for coffee. I like to think that each cup has a crazy mix of relaxation and energy that is passed to the drinker. When I saw this idea in a local doughnut shop [another one of my loves], it seemed a perfect fit for our kitchen. It's really easy, super cheap, and comes together in a snap. 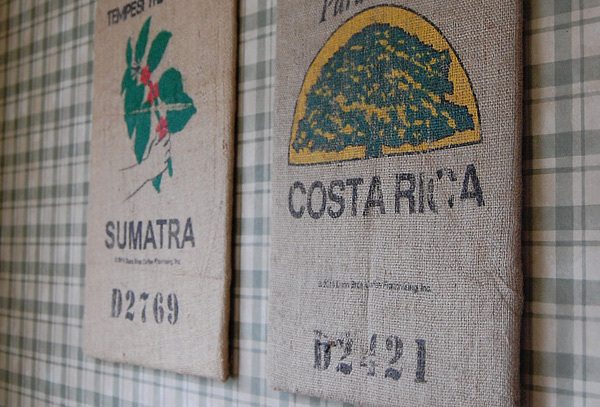 Step one: Buy some burlap bags from your local coffee roaster. These came from Dunn Bros and were $1 each. Buy some foam core board, and cut it in half [or not if your piece is smaller]. Step two: Center the design and pin the burlap in place. Trim down edges and corners to reduce bulk. Step three: Use a hot glue gun to secure the rough edges. Trim any extra fabric. Step four: Hang on the wall. We nailed right through the board, so even hanging them was easy peasy! Seriously, you should make this! If you're not into burlap sacks, fun fabric prints would be cute, too. I'd love to hear if any of you try this project! Love these! Burlap is my favorite this fall! This is yet another confirmation of our friendship... you are mildly obsessed with coffee and so am I! 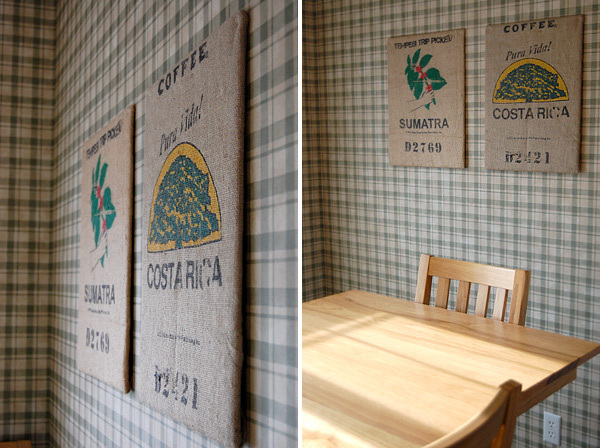 =) LOVE those wall hangings, they are perfect for the space!